How often do your students ask permission to continue their writing assignments at home? This was one of the many positive outcomes when I began using weblogs in my 5th grade French immersion classroom last spring. Not only did my students keep writing in the evening; they wrote on weekends, during spring break and all summer long. Weblogs, or blogs, are an interactive tool for journaling and exchanging ideas on the World Wide Web. They are easy to use and fun to read. In the most basic sense, a blog is an online journal. The wonderful thing for educators is that even novice technology users can write, revise, edit, and produce a polished webpage without any need for knowledge of HTML. The immediacy of the process and the access to a broader audience make weblogs a powerful tool for any writer. Current research tells us that the immersion student is a successful reader of their second language, yet they often lag behind in their writing skills. “Trying to grasp the concepts of print — such as sound symbol relationships, directionality, and the notion that written symbols are not arbitrary, but fixed — is obviously much more difficult in a language in which you are not strong” (Gibbons, 2002, p. 52). As an immersion educator in this setting, I find that the opportunity to use composition skills in a novel medium contributes to students’ understanding of the writing process. writing skills. Because writing is specifically required by No Child Left Behind (NCLB) standards-based testing, increasing motivation matters. Before including a new instructional strategy in our teaching there needs to be a clear understanding of why we are integrating this approach. Here are five reasons to weblog with immersion students. Ease. Students have quick and easy access to a broad audience with little technological skill required. The end product is a polished and widely accessible webpage. Posting and editing can be done virtually instantaneously. Archiving. Entries are dated and organized chronologically by title. This allows the weblog to act as a portfolio as well as to provide students the opportunity to build on their own ideas and the ideas of others. Multi-media. Weblogs allow students to add images, sound, video, hyperlinks, and polls to their writing. These interactive and multifaceted tools grant students access to multiple forms of communication. Feedback. By using the response forum in weblogs, teachers, parents and peers have an opportunity to read and post their insights. Students are encouraged to reflect on their peers’ writing and provide meaningful, immediate feedback. Meaning. Students are more engaged and motivated when they realize that their writing will be read by others. This authentic interchange gives them one more avenue to develop writing skills in their second language. Setting up weblogs for your students takes a few hours, but once established they can act as online portfolios for years. I have left the weblogs from my previous class open, and these now sixth-grade students continue to add to them to this day (one of my most active writers is no longer even in our school!). In Saint Paul Public Schools, weblogs are easily added onto classroom homepages using the district software Urban Planet. Prior to setting them up, students select pseudonyms to protect their identity. As an added security measure, I protect the main page with a password so that only families and students have access to the blogs. All comments posted in response forums are emailed to my school address. Weblogs can also be set up through many free servers on the Internet such as www.blognet.info, www.blogger.com, and www.xanga.com. Clear expectations are definitely needed before launching any online activity. We discuss appropriate postings; quality of writing, grammar, and spelling; and thoughtful responding. Rules are drafted together as a group and then posted in the classroom. We also take time to look at other student weblogs and well-known weblogs on the Internet (see suggested URLs in the sidebar). Doing this provides students with an understanding of the power of writing for what is essentially a global audience. To target NCLB writing standards, I focus on four key types of writing when using blogs: descriptive, narrative, clarification and persuasive. Below are descriptions of these activities as well as some further suggestions for blogging lessons. Descriptive Writing. Using a digital camera, have students photograph an interesting image (e.g., nature scene, desktop, face). Before writing, brainstorm sensory-rich vocabulary. Students upload their photos to their blogs with a rich descriptive article detailing the scene. Narrative Writing. To scaffold the key elements of story (plot/conflict, setting and character) students create concept maps using the software Kidspiration. Using these outlines, students write and then post their stories with concept maps. Clarification Writing. Allow students to research their favorite educational website. Using the five paragraph format, students are required to draft a thesis and give three reasons supporting their site selections. A link to the site and a snap poll make the entire experience interactive and engaging. Persuasive Writing. Teach this in the form of a script and a 30-second Public Service Announcement (suggested themes include anti-bullying, no littering, be yourself, say no to drugs). Content-obligatory language about video and filming can be studied. Videos are filmed, edited (using iMovie or RealPlayer), and posted on the weblogs where they can be viewed by friends, peers, and families. Current Events. Students can create links to newspaper articles in the target language on current events of interest. Opinion pieces and discussion forums allow for meaningful interchanges. Internet Shorthand. Students learn internet shorthand in the target language as one of the ways to respond to a peer. It is engaging and real, as this is one way in which young people today enjoy communicating. Reading Responses. Rather than a book report, students can write a reading response on their weblogs. Some ideas include rewriting a scene from a different character’s perspective, writing an open letter to a character or to the author, crafting a newspaper-type review with poll, creating a radio advertisement sound recording, developing a character trait diagram (using Kidspiration), writing a new book ending, or finding five related internet links and explaining how they relate to the book. With all of these activities, be certain to include follow-up time for students to read and respond to each other’s work. It is in this sharing time that the real learning and most meaningful interchanges occur. The key advantages of using weblogs in the classroom include high student motivation, technological skill development, and the use of the response tools to interact with peers and to construct knowledge. Most notably, weblogs provide easy access to both a polished finished product and an authentic audience. By individualizing the types of postings to reflect student interests, enthusiasm is very high and the learners take pleasure in creating new entries for their weblogs. 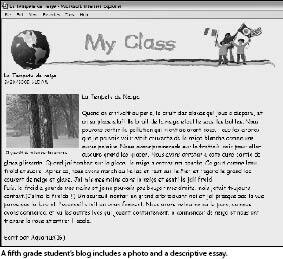 It is evident that weblogs can motivate and assist elementary students in both reading and writing in their second language. Writing tools in Microsoft Word provide support with grammar and spelling, and weblogs offer learners the capacity to express themselves not only through these texts but through images, sound, graphics, surveys, and links. Furthermore, students are enthusiastic about reading and responding to each other’s articles. Pedagogically, it is valuable to give students the opportunity to develop their language and technological skills in a real–world setting whenever possible. Weblogs, due to their multimedia attributes, provide endless opportunities to write, read, and share.